Enter Our Dogs Change Lives Contest! Our Dogs Change Lives contest is live! Share your story about how a dog has changed your life or the life of someone you know, and you could win $1,000! These can be stories about service dogs, fire or police dogs, or even a family pet. All dogs have the ability to change someone's life. You'll be able to submit your true story throughout February. Starting in March, you'll be able to vote for your favorite story. The story with the most votes will win $1,000! Visit www.dogschangelives.org to submit your story. Anyone can submit a story, but you must be at least 18 years of age and an American citizen to be eligible to win a prize. The story with the most votes by midnight on March 28 EDT will receive the $1,000 Audience Choice Award. You'll be able to vote once a day for your favorite story from March 1 through 28. The entry with the most compelling story about a dog's impact on a person's life will receive the $500 Life-Changer Award. A panel of expert judges will determine the winner. We will announce the winners on March 29. Visit www.dogschangelives.org for the complete rules and to submit your story. Spread the word! We can't wait to read your stories! New Contest - Dogs Change Lives! As a service dog organization, we see dogs changing lives every day. But we know that dogs don’t need to be service dogs to change someone’s life. We would love to read your stories about how your dog has changed your life! We’re holding a contest called Dogs Change Lives, where you can share your story of how a dog has changed your life, or the life of someone you know. You could win $1000! From February 1 to 28, you’ll be able to submit your story. Then, throughout March, you’ll be able to vote for your favorite story. The story with the most votes by midnight on March 28 will win the $1000 Audience Choice Award! There will also be a $500 Life-Changer Award for the most compelling story about how a dog has changed lives, which will be determined by a panel of expert judges. Look for a post on Monday, February 1 with the link so you can start sharing your stories about how dogs change lives! You’ve met SSD Nubble and Onyx – now say hello to Aladdin! You probably noticed from his photo that Aladdin is not a little puppy. He’s actually in advanced training, although he is currently on medical leave. Aladdin and his brothers Phillip and Caspian are recovering from surgery to correct Cauda Equina Syndrome (see our Help the SSD Princes blog post to read more about these dogs and Cauda Equina Syndrome). The good news is, they’ll all be back in advanced training by March! Aladdin is currently at home with his puppy raiser family. 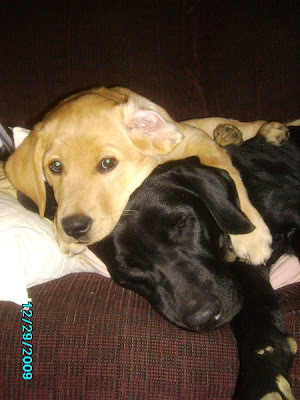 Cindy remembers the day SSD placed the little black lab in her arms. He looked up at her with his heart in his eyes, as if to say “I’m yours, for a little while.” He seemed to know he was on a path toward something bigger. Over a year ago, Cindy and her family answered an ad for puppy raisers. While they were waiting for a puppy, they puppy-sat for SSD Burke and SSD Sadie. Then the Royal litter was born, and Cindy and her family were weeks away from holding little Aladdin! During those weeks, they attended a few puppy classes, where they worked with SSD Gretel and Terra. They also went on several puppy outings to learn more about clicker training and loose leash walking before the big day at the kennel when they finally held the little black lab they would be raising for the next 15-18 months. Aladdin does have a playful side, though. When he was playing outside with Cindy’s daughters, he would grab them by the seat of their pants and drag them through the yard! He also has a protective side. Every time they went to the park, Aladdin would stick close to Cindy’s three-year-old daughter, watching. 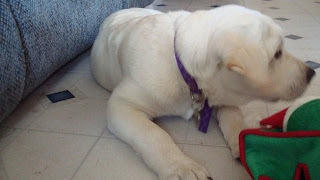 When Aladdin entered advanced training at the kennel, it was both exciting and heart-breaking for Cindy and her family. Exciting because he was moving on to the next step in his training, but heart-breaking because it meant he was no longer going to spend every day with them. Even though the dogs go to the kennel for advanced training, they still return to their puppy raiser families for the weekends. Cindy’s three-year-old daughter loves to pick up Aladdin at the kennel, but Sunday night or Monday morning inevitably bring some tears when he goes back to continue his training. It was during one of his weekend stays that one of our trainers had to tell Cindy that Aladdin had Cauda Equina Syndrome. The nerves in his lower spine were compressed, which was very painful for him, and he needed surgery. Cindy was devastated for Aladdin. If the surgery to correct it didn’t work, he would not be able to continue training to be a service dog. After the surgery, Cindy brought him home to recover. She tried to explain about the surgery to her three-year-old, so her daughter wouldn’t think he was back for good. Her daughter responded by calling him “Aladdin with a tear” because of the “tear in his back,” as her daughter called the stitches. Aladdin has been healing nicely, although he did have to have his stitches put back in. We’re all so glad he will be returning to advanced training in March! While Aladdin was still in advanced training, Cindy and her family received another puppy to raise – SSD Shamrock from the Crayon litter! Shamrock is much more free-spirited than Aladdin, but the two dogs got along great right from the start. Now that Aladdin is well on his way to recovery, meal time is a challenge. Cindy has quite a time making sure that each dog gets the right food dish with the right pills! (Aladdin gets three pills to help with his recovery, and Shamrock takes vitamin C.) She labeled their bowls so that she wouldn’t accidentally mix up their food and give the dogs the wrong pills. But labeling the bowls only helped prevent human error. It didn’t take Shamrock into account! One morning, Cindy had just finished getting the dogs’ breakfast and pills ready when Shamrock jumped up and knocked both bowls out of her hands! She dove to the ground and tried to cover up all the pills and food so that Shamrock and Aladdin wouldn’t scarf down the wrong pills! Luckily, her kids were home to help out. Look for more of Aladdin’s adventures as he continues to recover and reenters advanced training! Sometime this week, you're in for a surprise! We're changing the look of our blog. We really like the new design, and we hope you'll like it, too. So, if you click on our blog and it looks completely different, don't go away! It's still us. We have a lot of exciting things happening this week and next week, so visit us again soon! Lots of PawsAbilities, Coming Right Up! It's that time of year again! Mark your calendar and buy your tickets for PawsAbilities 2010! On Saturday, March 13 and Sunday, March 14, bring your dog and join us at the Farm Show Complex in Harrisburg, PA for two fun-filled days of PawsAbilities! This is a festival for people and dogs of all ages, and there will be lots to do. Frozen Woofys Dog Olympic Games - compete in events like Doggy Limbo, Marathon Down, and Puppy at Heart Relay. Abrams & Weakley Parade - strut your stuff in this parade around the PawsAbilities floor! Great Biscuit Bite-Off - bake your dog's favorite treats and compete against other bakers. Canine Marketplace - shop at the many vendor booths. Visit http://www.pawsabilities.net/ for more information about these and other events at PawsAbilities 2010. Tickets cost $8 for adults, $4 for children in advance or $10 for adults, $5 for children at the door. Click here to buy your PawsAbilities tickets. We hope you'll come out and support SSD for this weekend of PawsAbilities! Thank you to everyone who came to Chocolatefest this weekend! Thank you for supporting Keystone Human Services and Susquehanna Service Dogs! During the Premiere session of Chocolatefest, SSD Terra picked up a quarter. It was the first time she has ever done this, and she managed to do it amid all the crowds and distractions! Nice job, Terra! SSD Rossi and Midge were also at Chocolatefest and got lots of attention. Here, Midge gives a paw. Walking around Chocolatefest can be a challenge for a service dog-in-training, especially with all sorts of treats on the tables and dropped on the floor. Despite the temptations, SSD Star gave great attention to her handler. If you didn't have the chance to go to Chocolatefest this year, we hope you'll join us next year! Mark your calendars for chocolate on January 16, 2011. And don't forget about the next big event - PawsAbilities! This family event for dogs and people alike is coming up on March 13-14. Look for posts about PawsAbilities each week. 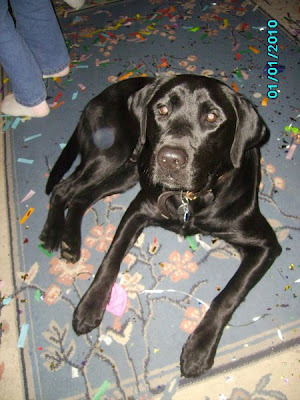 SSD Onyx spent a week with her brother SSD Denim, and they rang in the New Year together. Or, they would have rung in the New Year if they had been awake. Both Onyx and Denim curled up in their crates and fell asleep around 7 p.m.! Demin's puppy raiser actually had to wake them up so she could move their crates into her room for the night. The dogs went right back in and fell asleep again. When they weren't sleeping, Onyx and Denim had a great time together. They would play, and play, and play, and then collapse into sleep. When they woke up, they'd start the cycle all over again. Onyx used her stalking skills on her brother. He was lying under the table, and she sneaked up on him. She pounced, he jumped, and off they went, tearing around the house! Denim's puppy raiser got the two dogs into a routine. She found that she had to feed them separately, otherwise they turned it into an eating contest! At the end of the week, after Onyx returned to her own puppy raisers, Denim moped around the house. He missed his sister! Since our last post about Onyx, her puppy raisers, Mark and Carol, have been working on leave it with her. Onyx has nice self control! Carol can put a piece of chicken, Onyx's second favorite treat (next to cheese whiz), on a chair and tell Onyx to leave it. Even when Carol walked about ten feet away, Onyx still left the chicken alone! Leave it when the tasty chicken is on the floor is a little more challenging. The first time they tried it, Onyx lunged for the chicken and Carol had to quickly cover it with her hand. After that first lunge, however, Onyx did much better. When she thinks one of her puppy raisers has cheese whiz or chicken in their hands or pockets, she'll throw herself into a down and look up expectantly. In fact, just last night she tore down the stairs and threw herself into a down at Carol's feet, looking up as if to say "See? I'm doing something good! I deserve a treat!" She still likes to chew, especially on the metal legs of the coffee table. However, she is starting to release faster when asked to leave it. Progress! This week, Onyx visited the chiropractor with Mark and Carol. After making sure that the chiropractor didn't mind if they brought Onyx inside, Carol decided to try practicing some skills with her in the waiting room. At first, the puppy wanted nothing to do with training, not when there was a whole room full of stuff to investigate. She eventually settled down and was able to get down to business. However, Carol discovered that it's much more challenging for Onyx to give behaviors in unfamiliar environments, and they're going to really start practicing skills in new places. All of the dogs and puppy raisers are required to attend puppy classes, where they can ask questions and learn new skills to work on. In the last class, we started woring on shaping. 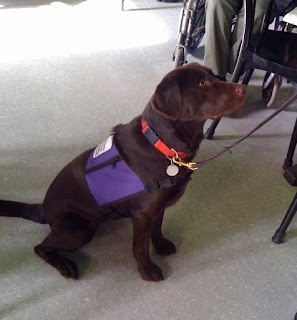 Carol has been working with Onyx to shape visit, in which the dog puts its head on a person's lap. Onyx is still a little confused about the concept of shaping, but she's starting to get the hang of it. In our last post about her, we mentioned that she was growing quickly, and she certainly hasn't stopped! She is losing her puppy face and now has a small adult face. But even though she's starting to look like an adult, she still acts like a puppy. She seems to be looking for trouble all the time. Lately, she has started countersurfing, especially since she's now big enough to reach. She usually countersurfs when Mark or Carol are doing something in the kitchen, and she seems to be more curious than interested in swiping things off the counter. Her puppy raisers have to be vigilant to keep her from investigating. Every morning, Onyx walks down the pier with her puppy raisers. They live on one of the off-shoots of the Chesapeake Bay, and Oynx loves to look around. Once a flock of honking geese flew overhead. Onyx took one look at these strange loud creatures in the sky, decided they were too scary, and bolted - right into Carol's legs! Later that afternoon, another flock of geese flew by, but this time, she didn't bolt. Onyx is making progress, sometimes slowly, sometimes very quickly. Come back next week to check in with Onyx and her puppy raisers again. In a previous post, we talked about the basics of our 12-month evaluations for the dogs. During these evaluations, we focus on getting a good sense of the personality of each dog - learning who they are and how they respond to different situtations, including stressful ones. We ask the dogs to perform several tasks, such as basic obedience, recalls and shaping skills. Our puppy raisers are responsible for teaching the dogs many of these skills and behaviors. We have several videos of dogs-in-training demonstrating the types of skills and behaviors we require in our service dogs. We use shaping to train our dogs to do many of the behaviors they'll use as service dogs. The goal of this particular session was to get SSD Sunshine to put her foot on the upside-down food dish. Her handler starts by clicking her for looking at the food dish, then stepping toward it, touching it with her paw, and finally, placing her foot on the food dish. If you'd like to read more about the basics of shaping, read Clicker Training: Shaping a Behavior. 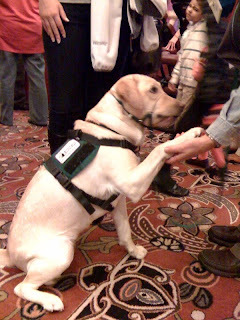 Many times, service dogs will need to pick up objects that their partners may have dropped. In this video of the Take It game, the dog receives a click and a treat for going to pick up one of the objects. Self control is extremely important in a service dog. We don't want our service dogs to give in to their every whim, sniffing and chasing after everything they find interesting. If a service dog gets distracted by everything in their environment, they won't be able to assist their partner. One area where we train self control is at meal time with the food bowl. Watch SSD Thunder demonstrate his self control. His handler waits until he sits calmly before putting the food bowl down. Then Thunder must wait to eat until he receives the "okay" cue. We usually wait until the dogs makes eye contact with us before releasing them to eat. Even though Thunder's head is bent toward his food dish, notice how his eyes flick upward just before he gets the "okay." These are just a few examples of the skills of a service dog. Coming next week, we'll share a post about balance dogs. It has been a fun and busy two weeks for SSD Nubble! He went to the SSD Northeast Division holiday party, where he made all sorts of new SSD friends! Just like most puppies, he wanted to play with the bigger dogs. 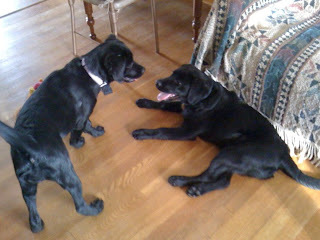 He seemed a bit intimidated by SSD Slate, a puppy that's about a month older than Nubble. 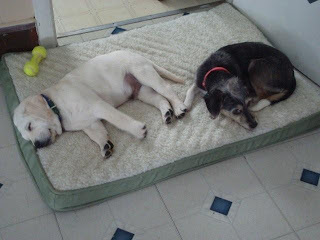 It may be a good balance for Nubble, however, because he tends to dominate Gizzy, his puppy raiser's family dog. But even though he was intimidated by Slate, that didn't stop him from making friends. Donna and Lindsey, his puppy raisers, think he has a crush on SSD Sky, a pretty, black, 13-month-old female. All in all, he held his own, even though he was the youngest puppy there. On the Saturday after New Year's Day, Donna took him to run some errands. They started at Walmart, which was a real test of Nubble's skills. The place was packed! Even though Donna only needed one thing from the store, Nubble has reached his limit by the time they left. He usually does very well with loose leash walking, but in Walmart, he wanted to chase every little piece of trash on the floor, and he was fascinated by people's shoes. Leave it worked fairly well, but it was still a more difficult trip. However, he did great at the next two stops! At Redner's and Wawa, he sat beautifully next to Donna while she checked out. Nubble is growing, growing, growing! Donna has 2.5 acres for him to run around, but when they first got him, he could barely make it 1/4 of the way around the property. Now he runs the entire thing! He even found a new toy to play with outside - leaves, especially leaves blowing across the snow. He is very smart and loves to learn, but just like a child, he'll play and get into trouble if he's left alone. "I really need to stay focused on his training. Otherwise, he just acts like a typical puppy," says Donna. And Nubble is not a typical puppy. Although he's certainly allowed plenty of play time, he also needs to learn the skills and behaviors that will help him successfully assist his future partner. In puppy class this past week, the Northeast Division worked on shaping. (To learn more about shaping, read Clicker Training: Shaping a Behavior.) 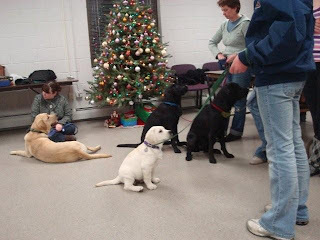 This class was a learning session for the puppy raisers as much as for the puppies. The goal was for Nubble to move a mini-skateboard. To shape this behavior, his puppy raisers started by clicking him for looking at the skateboard, then for touching it with his paw, and finally for pushing it with his feet. At home later, Donna and Lindsey continued working on shaping with Nubble. 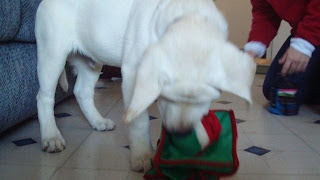 He had received a toy plush box from the volunteer leader of SSD's Northeast Division, and Donna and Lindsey used shaping to get him to pull a squeaky toy out of the box. It went well! This past Saturday, Nubble went with Lindsey to her winter track meet at Lebanon Valley Community College. What a well-behaved boy he was! Donna took the opportunity to work on going in and out of doors. All SSD dogs are trained to wait patiently at the door, only allowed to go through once they get the "go on through" cue. Donna found that even though he was in an unfamiliar place, Nubble had a much easier time waiting patiently at doors during the track meet than he does at home, possibly because there were no other dogs or cats around to distract him. Nubble was fascinated by the runners and their bright shoes! With runners constantly going past, it was a good opportunity to practice sitting nicely while they went by. Eventually, Nubble got the hang of it, and by the end of the day, he chose not to chase every single runner. However, he did try to take a toddler's toy, and Donna spent some time working on leave it. Overall, the track meet was a very successful outing. Nubble did great! Many of the adults at the meet asked lots of questions about him. 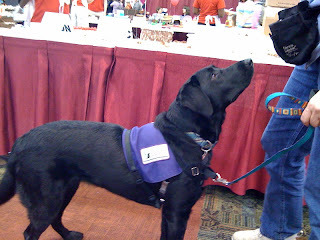 In fact, people seemed to recognize that his purple puppy harness meant that he was a service dog-in-training. Because people seemed familiar with service dogs, they tended not to rush over to pet the puppy - one less distraction for Nubble. "It makes me feel good when we have a successful day!" says Donna. 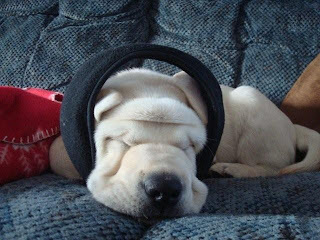 Needless to say, Nubble slept very well that night. Instead of whining for a long time when he goes into his crate for the night, now he only whines for 30 seconds before falling asleep. What an improvement! Sit, down, stand, stay, leave it, come, loose leash walking, waiting patiently at doors - by the time our service dogs-in-training are one year old, they should know all of these skills. And to make sure they know them, we test each dog when they turn one year old. On Friday, we held our 12-month evaluations for the dogs that are between 11 and 13 months old. This testing allows us to see the progress the dogs have made and discover skills and behaviors the dogs still need to work on. This is also the time when we start to make decisions on whether a dog will continue in the service dog program. Some dogs' skills may be better suited to other lines or work. For example, SSD Honeycrisp (renamed Chloe) and SSD Penny (now called Jade) are now working for the UN, sniffing out explosive devices. Both of these dogs were too focused on their sense of smell to be successful service dogs; however, that same sense of smell makes them perfect for their present position with the UN. During the 12-month temperament test, we evaluate the dogs in cued and un-cued attention, self control, recall, shaping skills, basic obedience and interactions with other dogs, animals and people. We will compare their results with their results from their 8-week evaluations, so we can see their progress. On Friday, we evaluated 12 dogs from the Old West and Hill Top litters - Oakley, Cimarron, Stetson, Denver, Zane, Journey, Thunder, Star, Sky, Sunshine, Hawk and Misty Morning. We also retested one dog that had already been placed with a partner but needed a reevaluation. We will be comparing their results with the results from their 8-week tests, so we can see how they have improved. Usually, we see great improvement, thanks to our wonderful puppy raisers! In one of our next posts this week, we will share some of the highlights of the dogs during the test. "Rossi, puppy in a box." At those words, SSD Rossi puts one, two, three, all four feet inside an empty half-gallon ice cream container. Pretty neat trick, isn't it? While puppy-in-a-box might not be a typical service dog skill, the method used to teach it is an important part of our service dogs' training. Rossi's handlers used shaping to train her to put all four feet in an ice cream carton. When you're shaping a behavior, you're reinforcing small steps toward the behavior until you achieve the actual behavior. 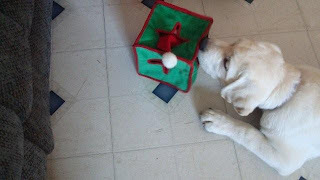 For example, to shape puppy-in-a-box, you would start by clicking your dog for looking at the box, then build up to touching the box with his nose, touching it with a paw, putting a paw in the box, putting two feet in the box, etc. We generally don't talk or communicate with the dog while we're shaping a behavior. We want the dog to experiment, move around and offer different behaviors. When the dog gives a behavior that is a step toward the final behavior we're looking for, we click and treat. Often, we'll toss the treat away from the dog to reset him, so that he has to move around and offer a slightly different behavior. When the dog is giving a behavior 80% of the time, we'll raise our standards for which behaviors get clicks. For example, instead of clicking for touching the box with a paw, we'll wait for the dog to leave his paw in the box for a few seconds, then click and treat. We took video of Rossi demonstrating shaping at one of our puppy classes. Her handler wanted her to pick up a piece of garden hose and place it on the wooden podium. To train her to do that, he clicked and treated her for small steps along the way - looking at the hose, picking it up, walking with it, walking toward the podium and finally, putting the hose on the podium. Notice how he keeps raising his standards, making Rossi experiment until she finds a behavior that gets her a click. Also note that when Rossi seems stuck, her handler moves around to both reset her and give her hints about what he wants her to do. Mary Hunter, a clicker trainer and blogger, has a very nice video on her Stale Cheerios blog that illustrates shaping. You can see how the dog continually experiments with behaviors until he discovers the one that earns him a click and treat. As we refine a behavior, we add the verbal cue just before the behavior is given. Over time, we will only click for behaviors that we specifically asked for using the verbal cue. 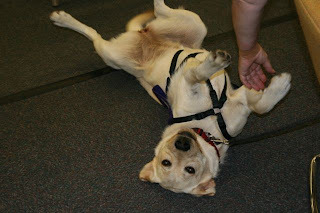 Shaping is a very positive method of training dogs (and almost any animal), and we use it in our service dog training. 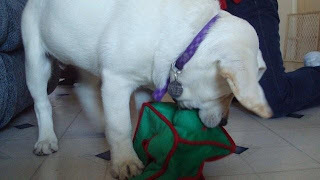 It teaches the dogs to experiment with different behaviors, and it's fun for both our service dogs-in-training and our trainers and puppy raisers. 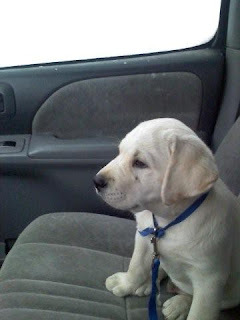 In the middle of a snowstorm, a little yellow lab puppy arrived in Hamburg, Pennsylvania. That car ride from Maine to Pennsylvania marked the beginning of a very important journey for SSD Nubble. 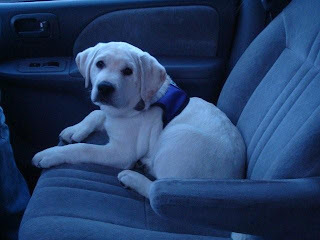 He began his journey to becoming a service dog. We're going to be following Nubble as he learns new skills and behaviors. 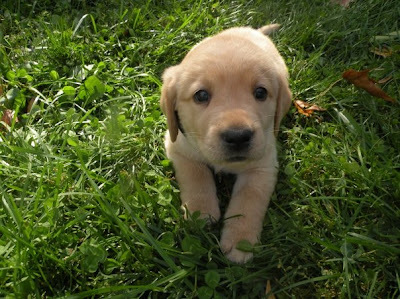 Over the next 18 months, you'll find out exactly how a cute little puppy becomes a highly skilled service dog. Last week, you met SSD Onyx, and we will soon be following SSD Aladdin as well. Look for weekly posts about these three dogs' journeys. Most of SSD's dogs come from our own breeding program, and the names of each litter center on a theme chosen by the mother's breeder caretaker. Nubble, however, comes to us from a program in Maine. He gets his name from the Cape Neddick Light, a lighthouse in Maine known as the "Nubble Light" by the locals. Nubble joined his puppy raiser family on December 5. He is the first puppy they are raising for a service dog organization. Donna and her 15-year-old daughter, Lindsey, are raising him together. They are part of our Northeast Division, which is spread across northeastern Pennsylvania. Although they have a dog of their own, a terrier mix named Gizzy, raising a puppy to become a service dog is completely different from raising a family pet. It has been a learning process for everyone. 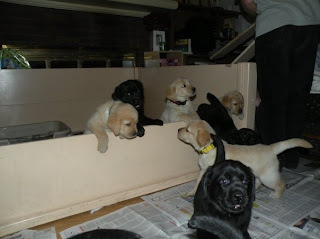 Having a strong network of other volunteer puppy raisers in the Northeast Division has helped. They can ask questions and get advice and feedback from other volunteers. What do Nubble's puppy raisers have to say about having him in their family? "Nubble is an absolute joy to have in the house!" He and Gizzy get along extremely well. When he first arrived, Gizzy was very gentle with him. as he has grown, she has adjusted her behavior toward him, starting to treat him less like a puppy. And of course, she doesn't hesitate to let him know when he's pushing his boundaries with her! Nubble does very well in the car. Other than that first long car trip, he has not gotten car sick. He spends most of his time in the car either sitting or sleeping. When he and Gizzy are in the car together, she sits on him and he lets her get away with it. Already, Nubble has learned several cues. He knows sit, come, down, and up (on the couch), and responds to his name. He also targets his puppy raiser's hand. Right now, he's working on stay. He's having a little difficulty with this one, but with some practice, he'll get it. He's a very smart puppy, and he really wants to please his puppy raisers. These cues are part of basic obedience and are an essential part of a service dog's training. All of our service dogs must master these skills. In addition, a willingness to please their handlers is important. And Nubble is constantly learning and exploring. You know how babies and toddlers explore their world by putting things in their mouth? Well, one of Nubble's favorite things to do is chew. And chew. And chew some more. He will chew on anything. "It's like having a toddler in the house. You can't take your eyes off him," says Donna. Since getting Nubble, Donna has changed the way she manages her household so that Nubble can get into as little mischief as possible. Although there isn't much she can do about chair legs, doorstops, door knobs, rugs, floor tiles, the dishwasher and the refrigerator, she has removed all other items that he could possibly chew on. In fact, the family decided to get a small Christmas tree this year and put it on a table, so Nubble wouldn't have the opportunity to try to gnaw on it. "He would have eaten the whole tree, decorations and all!" says Donna. As his first outing, Nubble went to a pet store, and everyone who saw him, loved him! They loved him so much that it was difficult for people not to pet him. However, regardless of how cute the puppy is, service dogs and service dogs-in-training are working dogs, and they should not be petted, fed, or distracted in any way while they are working. (General rule of thumb: If a service dog is wearing his vest, he's working.) But, despite the distractions of people trying to pet him, Nubble's first outing was a success! He met a lot of people and came into contact with many new smells - an important part of socialization and becoming comfortable in any environment. Since then, Nubble has been to convenience stores, a bookstore, a grocery store and the vet. He's usually very well behaved, thanks to the clicker and lots of treats! Once Nubble has been fully housebroken, he will be spending time with Lindsey at school. So far, he has been to school for 10 minutes to meet the guidance counselor and principal and show them what he has learned. When people find out that Donna and Lindsey are raising Nubble to be a service dog, they often ask, "How are you going to give him up?" "Honestly," says Donna, "when you decide to do this, you understand that the puppy has a greater life ahead of him than just being your dog. I feel very blessed that we can help do our part for someone else."